An interesting chart regarding the April windstorms has been posted at the OnebarkBlog. I was wondering if you had noticed an increase in problems and death of mature white oaks. We seem to be getting a lot of requests for white oak removals and judging from photos and site visits it's a real situation. 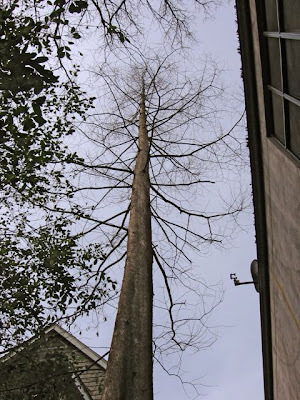 On September 7, 2006 the San Francisco Chronicle reported that researchers had just discovered a 378 foot (113 meters) tall tree that is probably the world's tallest living tree. If you think you can find a tree that can break that record, or just want to measure that tree in your backyard, try these techniques. These methods can also give you a good approximation of the heights not only of trees, but also of telephone poles, buildings, magic beanstalks—pretty much anything tall. Know your exact height in the shoes you will be wearing to perform this method. Following Sunday night's strong winds across Atlanta , radio station WGST interviewed Susan Granberry of the Georgia Forestry Commission. The main question posed to Susan was: "what should people do if they are worried about their trees?" Susan's answer? Simple. "Homeowners should immediately inspect their trees following a storm." Excellent idea! We like that. In fact, we recommend regular tree inspections so that a property owner is prepared before any storms. If you have vary large trees, you should have them professionally inspected at least every 3 years. If you have never had your trees inspected, nowis the time. A basic inspection costs less than the yearly maintenance inspections of your furnace - and a furnace is not likely to damage anything if it falls during a storm.